Let's have breakfast together. Learn about DevOps success stories and get inspired before your workday starts. 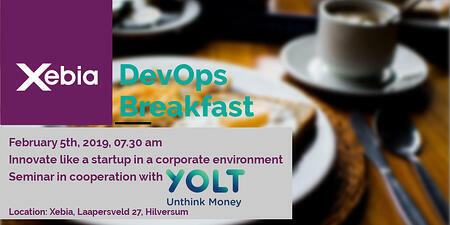 Xebia cordially invites you to our DevOps breakfast series. This breakfast session will take you through how innovation can happen in a large organisation such as ING: the excitement of building an innovative idea such as Yolt with the support and comfort of a large corporation, the challenges when innovating in an environment where there is a proven and reliable standardisation in place. Yolt launched in the UK in June 2017 and scaled up to 500,000 registered users in less than 18 months. Since then we launched in Italy and France! Yolt is a mobile app that changes the way you think about money. It gives you the possibility to synchronize your accounts in one view, see your spending clearly and do more with easy budgeting. Told from the perspective of the Yolt IT infrastructure team, we touch on different aspects of our journey such as dealing with business expectations, learning how to change existing processes, and getting the right people into the team. We share what is it like being the first in many things within ING, keeping ahead in a racing market and working together with security, legal and compliance departments. The talk will go into how seemingly normal technology choices can be seen as controversial and how architecture can have different angles. We have been (and still are) challenging ourselves continuously to ensure that we are not giving in to the temptation of following expectations or falling back into familiar ways of using technology. We don’t have all the answers, but we do have a story. We hope to talk to you and hear your ideas.